Fun Halloween Books for Kids | Kid Reporters' Notebook | Scholastic Inc. The town of Dedham, Massachusetts, had some spooky visitors on October 29. 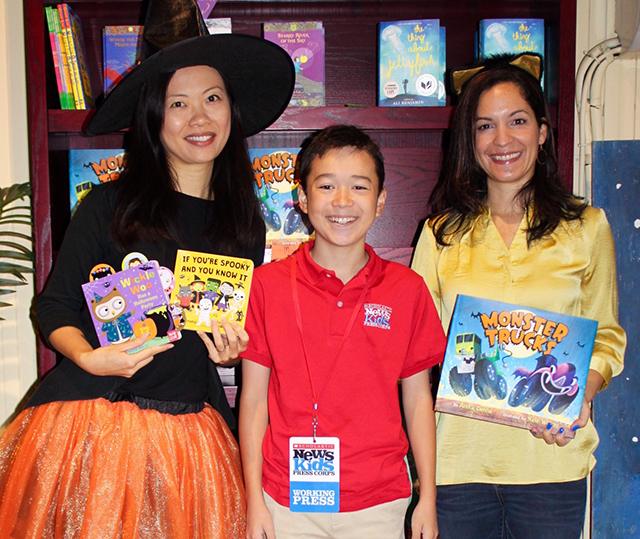 At Blue Bunny Books, kids in costumes were treated to Halloween stories, arts and crafts, and cupcakes. Children’s author Anika Denise read her new picture book, Monster Trucks. Illustrator Jannie Ho shared her latest book, If You're Spooky and You Know It, which was written by Aly Fronis. Before the festivities began, I had the chance to talk with the Denise and Ho. Here are excerpts from our conversations. What was you inspiration for Monster Trucks? Anika Denise: The idea came to me from my little godson. I give him a book for every birthday and holiday. I ask his mom what he's interested in, and there was a time when he liked reading books with monsters or trucks. So I thought that I would write a book with both. I started making notes for a Halloween-themed book with characters that were trucks, but they really were monsters. AD: I wanted to be a movie star for a while. Then I wanted to be a ballerina, but I wasn't very graceful. Later, I wanted to be a professional gymnast when ballet didn't work out. There was never a time when I thought that I was going to be an author as a career, but I always did like to write. Did you have a special teacher who made a difference? AD: My English teacher in tenth grade was lots of fun. He was the first one to tell me, "I think you are a really good writer." That gave me a lot of confidence. Then there was another teacher who gave the assignment to write an original sonnet. We were studying Shakespeare. I loved writing poetry. The teacher read my sonnet, and she said that I must have gotten help or I didn't write it. I told her that I did write it, and I was really proud of it. She was actually a nice teacher, but I think the fact that I wrote it well caught her attention. The injustice of her not believing me, and the compliment that it was good enough that she didn't think I could write it, made me want to grow up and become a writer. We wound up being friends in the end. How did you get started writing children's books? AD: I worked as a copy writer in advertising for many years and thought that would be my career. Then I met my husband, Christopher Denise, who is an illustrator. I saw his books and his career. I thought that maybe I could try to write a book that he could illustrate. He encouraged me. What books have you and your husband worked on together? Which one is your favorite? AD: We have three books together so far. The first was Pigs Love Potatoes, which is a rhyming counting book. The second book was Bella and Stella Come Home, which is about a little girl who has to move to a new house. Our third book was Baking Day at Grandma's. Picking a favorite is really hard because it's like picking a favorite kid. I love them all for different reasons. Baking Day at Grandma's is a particular favorite because it has so much of our life in it. I wrote it for my grandma who lives in the Adirondacks. I have three daughters, and our family goes there every summer, and often in the winter. The book has a lot of memories, and I recognize the mountains where we hike or my aunt's couch in the illustrations. AD: Every Halloween, my grandmother would dress up in a witch's costume and sit on the front porch. She made homemade cider donuts and spiced hot apple cider. When families would come, they would get candy and donuts and cider. Now, I have a porch, where I offer donuts and apple cider. It's nice. Neighbors stop by and chat. Who are some of your favorite children's authors and illustrators? AD: Peter H. Reynolds and Mo Willems. I love Leonardo, the Terrible Monster. Growing up, my mom read to me a lot. My two favorite books were Where the Wild Things Are by Maurice Sendak and Horton Hears a Who! by Dr. Seuss. The best way to learn how to write is by experiencing other people doing it—and that's by reading books. Just let yourself make mistakes. Let your creativity come out in your first draft. Keep a journal and notebook, and let your ideas flow. That's where the sparks come. That's where the magic happens. The first book in a new picture book series called Starring Carmen. It's illustrated by Lorena Alvarez and comes out in the fall of 2017 (Abrams). Then Chris and I come back together for a book called The Best Part of Middle, which is a book from the point of view of a middle child. How did you get started illustrating children's books? Jannie Ho: I went to art school for illustration, but when I left school I did more graphic design. I have always done design or art for kids. After a while, I left my job as an art director to go back to what I love—drawing. Then I got an agent, and I started getting assignments for magazines, board books, and picture books. JH: I use Adobe Illustrator for digital art. I've been doing that for 10 years, and it's my favorite computer program. I also like to sketch with pen and ink when I can. JH: Now that I have a 4-year-old daughter, I love going trick-or-treating with her. Last year, we started going to a friend's house where they do a little magic lesson and then have a dance party. What are some of your favorite picture books and illustators? JH: My all-time favorite is Busy, Busy Town by Richard Scarry. When I first moved to the United States, it was one of the first books that I got, and that really inspired me. I also love Around the World With Mouk by French author/illustrator Marc Boutavant. What is your best advice for aspiring illustrators? JH: Draw and experiment. There are so many different mediums that you can try. It's fun to draw with crayons and ballpoint pens. It doesn't have to be fancy. Don't follow the rules so much. It's fun to break the rules once in a while. Do you have a new project in the works? JH: I have a debut picture book that I wrote and illustrated, which is called Bear and Chicken (Running Press Kids, 2017). It's about a chicken that was frozen, and a bear found her. Chicken is afraid that Bear will eat her. You'll have to read it and find out what happens.